This requires a little elaboration. Dr Isis is a pseudonymous blogger. Much like me, she doesn’t use her real name for blog-related internet activities. As many bloggers choose to, she does this in order to speak more freely than the regular constraints of society might otherwise allow (once upon a time, this was a raison d’être of the internet). She’s also a professional scientist. 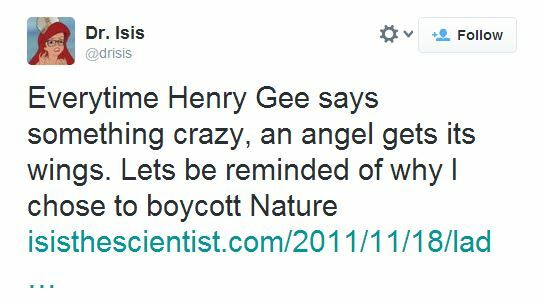 The man deriding and mocking her is Henry Gee, an editor for Nature – and for anyone who doesn’t know, Nature is one of the world’s top science journals, and one of the highest impact publications someone like me can ever hope to publish in. The part I’ve redacted is where he chooses to reveal her real name. Private information which he has acquired. Subsequently, he’s been mentioning her name every 4 or 5 tweets like a parrot on amphetamines. Very professional, I’m sure you’ll agree. Finding and publicising someone’s private information on the internet is a practice known as doxing. Usually reserved for the more toxic corners of the internet like 4chan, this is typically done in order to hurt people. Needless to say, this is not exactly something a professional twitter feed should be allowed to get away with. Frankly, this is unacceptable. I don’t care about any backstory, existing animosity, or anything like that. That’s not my business. This, however, is: Someone in a position of power, who represents an important organisation should not be able to get away with such blatant disrespect for any member of the community, no matter who they may be. An editor at Nature should not be calling a scientist inconsequential, and certainly should not be sharing their private information without permission. Three editors, all male. Three scientists/writers, all female. Three abuses of power. Coincidence or not, this is concerning. Deeply concerning. Isis, in a post on her blog, assures us that she’s ok (though after being publicly outed, there are others who have not been). But this latest event should be moving all of us in the community to start re-thinking things. Exactly how much should people in power be allowed to get away with. Zivkovic, for example, seems to have made some attempt at a triumphant return to the community, backed by various supporters and root vegetables. I’m not alone in feeling ill at ease about this. These people seem to be relatively free of consequences, and that is simply not right. In the latest case, we have an editor at a scientific journal divulging private information purely because he didn’t like someone. His twitter feed claims he was “victimised”. I know, right? You poor, poor editor man. Boo hoo. You’ve been treated so terribly by someone on the internet. Whatever will you do. Oh, that’s right. Perhaps you could maybe grow up and act like an adult? And what about the rest of us in the scientific community? We all submit private information when we try and publish an article. We all submit anonymous peer review comments. I don’t know about anyone else, but I don’t feel comfortable doing that when people like Henry Gee are involved, who may evidently be happy to use that information if he decides he doesn’t like me. For whatever reason (maybe this blog post?). In short, we, as a community, should not stand for things like this. We need to stop tolerating this kind of behaviour and, simply, prevent it from happening. And for the record, yes thanks to Henry Gee’s childish behaviour, it’s now very easy to find out Dr Isis’ identity. As a mark of respect, I hope everyone who reads my blog will do as I have: Forget it. Forget the name. Don’t Google it. Don’t find out her work details or her personal information. Don’t find her academic web page. Just don’t. It’s a matter of respect. As bloggers, some of us choose to wear masks and hide our real faces. Yes, they’re only masks, and yes any 13 year old with an understanding of the internet can probably find out our true names. It’s actually pretty easy to reach out and peel off the mask if you know how, but that doesn’t stop it from being insufferably rude and disrespectful. I’d hope that you all would accord the same courtesy to me, as a pseudonym user, as well as others like Sci Curious and Dr Sky Skull. Thank you. This entry was posted in academia and tagged blogging, misogyny, scientists. Bookmark the permalink. 21 Responses to We must not tolerate this. I haven’t been following this. Were you nutballs still throwing a fit over that dumb shopping thing from 2 years ago? Ok but Dr Isis information was posted on answers.com for the last 2 years. So is it OK if I post some of your Facebook stuff on my blog – is that OK? There is a really stinky double standard here…. If it’s able to be read on the internet, then doing that is your right. Facebook is not particularly private, no matter what some might like to believe. The guy in the link you posted, made a statement under his own name, to a large number of people. On the other hand, Isis herself has never (to my knowledge) disclosed her own personal information. Even if some jerk left some unverified comment on answers.com. This information was not publicised by her, i.e., this is not the same thing. This is the point which you seem to have difficulty grasping here. Calling attention to publicly available information is not a problem. Disclosing private information is. Is there anything about that which is still unclear? What you fail to grasp is why do you think outing a blogger unethical? really, very few people give 2 shits. I keep people anonymity simply because I’m a nice enough fellow and I don’t see reason to throw someone under a bus for no reason. There is a line that must not be crossed though, once it does, the ‘respect’ that I give the blogger is over. Isis was going out of her way to publicly insult and humiliate Henry. Yes, I agree that Henry’s writings are questionable but she was being personal and vindictive. Frankly Henry deserves some credit for not doing it sooner. Simply because you want to be anonymous it doesn’t mean you get to say anything you want and expect people to respect your privacy. Respect is a two way street. That’s what you’re not getting. The tweets from Dr Isis that you linked to are squarely directed at his role as a senior editor of Nature. Gee’s outing of Dr Isis was a response to a tweet about his role as a senior editor of Nature (which makes Nature’s claim that his response was in “a personal capacity” hard to fathom). According to what Gee just wrote on his blog, he has known the identity of Dr Isis for a couple of years. If the various comments from Dr Isis were indeed harassment (we don’t know the full details, so I’m not going to judge that), he could have asked her directly to stop them – he’s had years to do that. If a direct approach didn’t work and the comments were harassment, Gee could have asked Nature to have them stopped. A letter from Nature to any university in the world complaining of harassment of one of its staff members would not be ignored – it would be investigated. If it were deemed harassment, the university would put an end to it. It’s simple. Outing Dr Isis seems completely unnecessary, and even Gee admits he shouldn’t have done it. I’d say 99.9% or more of the scientific world don’t want personal vendettas solved by individuals resorting to personal attacks. So you are right, pseudonymous bloggers should not feel they are immune from the consequences of what they write. But vindictive responses to pseudonymous bloggers are not welcome in the scientific community – or at least not the scientific community in which I work. You word count in these comments, dear anon, is currently at 338. Clearly, you give quite a number of shits. Sure, what the guy said was douchey but as you say above THAT”S NOT THE POINT. She invaded his personal space and embarrassed him professionally. How is that different? It’s not. Because Isis didn’t out Dario Maestripieri. It was public knowledge (on his public Facebook feed) when she wrote that post. It’s not even remotely equivalent. Calling someone out for something fucked up that they say is not the same thing as punishing someone exercising their right to call people out. You’re right doxxing someone is extremely disrespectful. HOWEVER, when someone is being a total jerk I don’t see it as being that bad. Isis & friends did their best to DOX that idiot editor who started the DNLee thing – no one complained then. How about BoraZ’s acquaintances and friends who got thrown down when he fell??? Anions can’t have their cake and eat it too. If they are going to be extremely disrespectful to people they shouldn’t be surprised if people are extremely disrespectful back. Said idiot editor was an editor, working in a professional capacity and representing a large and well reputed organisation. This is not a valid comparison because employees working professionally are expected to use their names. Isis is working under a pseudonym. The man still known only as “Ofek” was not. As for acquaintances who got “thrown down”, well that’s just ridiculous. For one, again, Bora was not working under any kind of pseudonym. For two, it’s really lovely how you’re not blaming him for sexually harassing various women, but apparently blaming those who had the audacity to point out that sexual harassment is a bad thing. This is, frankly, reprehensible of you. Assuming you’re not talking about negatively charged chemical species here… Anons? An anonymous commenter is not the same as a pseudonymous commenter. I’d advise you to stop confusing those two stances. In this discussion we’re having now, you are anonymous. I am not. Does that mean the “quakes in its boots” line from Henry Gee was not so sarcastic after all…??? I have attended some training in dealing with sexual harassment and other forms of workplace misbehaviour. It was pointed out clearly to us that “What I did to her is nothing like what she did to me!” is not a valid defense of misbehaviour. That is especially true if in a position of power.